While Lana Crawley was born and raised in Chatham, and is currently residing here once again, she spent several years living in Toronto, Vancouver and Waterloo. These years were spent pursuing her career in fashion / retail management, following her graduation from Seneca College – Toronto with a diploma in Fashion Business. However, after several years in the business Lana decided that her career aspirations were leading her in a different direction. She decided that pursuing an education and eventually a career in Nursing would be a better fit. 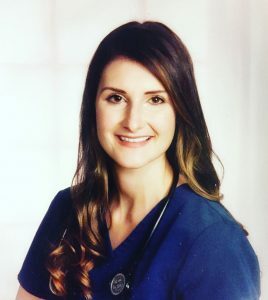 Lana began her nursing education in the collaborative program at St. Clair College – Chatham Campus in 2012, and graduated from the University of Windsor with honours in June 2016 with a Bachelor of Science in Nursing. During her undergraduate degree, Lana completed a placement with the Chatham-Kent Family Health Team. It was during this time with the team that Lana realized she had a passion for helping others through community outreach. Lana is now one of the Nurse Educators for the Chatham-Kent Family Health Team, in her first role as a registered nurse. Although this is Lana’s first job in nursing, Lana has worked at the Chatham Kent Health Alliance – Chatham Campus in various roles since 2013. Lana’s areas of interest in nursing include diabetes and mental health awareness and treatment. As someone with Type 1 Diabetes since the age of 16, her first hand insight into the disease is a great asset to our team and the broader community. Lana hopes to pursue her Canadian Diabetes Educator Certification to further expand upon her current knowledge and experiences. Lana has also had firsthand experience in helping those struggling with mental illness. This experience was the catalyst for Lana’s recent involvement with the Canada Mental Health Association – Lambton Kent Branch, in which she raised over $5,000 while running the Detroit Free Press Half Marathon. In appreciation of her efforts to raise awareness and funds for mental health programs in Lambton Kent, Lana was honoured to receive a recognition award. Lana is excited to join our team and will be facilitating group classes for Diabetes Master Your Health starting in 2017. In the meantime she will be providing individual counselling for Smoking Cessation. For information on any of the programs offered here at Chatham Kent Family Health Team, you may contact Lana at 519-354-2172, extension 1324.